What road do you live on? And, do you know how it was named? We live on Shore Drive and no, we don’t know how it was named. When we first moved here it was called Cahill Drive, at least that is what everyone called it. All of the roads off of Seaman’s Point Road were already here; there just weren’t that many houses on them. All of the property along Shore Drive was owned by the Cahills, except for two lots. There was a little camp, which is still here, and a little old trailer with a little old man living in it, which is gone now. It’s a funny thing. During the time we’ve lived here we have had four different addresses. When we first came up, my father’s address was Nottingham Road, Raymond NH. Then the next one was RD1, then a box number. We didn’t get an address with the right street or town until we had been here 11 years. We had to keep writing friends and families to tell them that our address had changed again. What year did you first come to Pawtuckaway Lake? 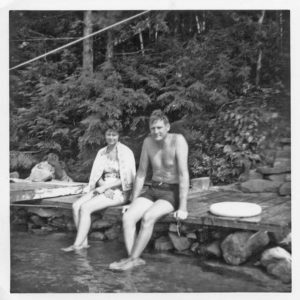 We first came to the lake in 1957. But, my parents were actually the first ones to come here. In 1958 they rented the tall white place in White’s Grove. It was only one story tall when we stayed there. It had two bedrooms, a living room, a kitchen, and that was about it. They had rented the house for two weeks and we came up for a week in July. Our daughter was five months old at the time. We drove from New Jersey to North Andover, Massachusetts, where my parents lived, and then we came up here. They built the place we are in now back in 1959. My father was a fresh water fisherman and they knew this lake was here. Three Sundays in a row they came up and tried to figure out where it was. Because they didn’t know what roads actually went down to the lake they couldn’t find it. Finally they stopped at White’s Grove, at the farmhouse, and talked to Web White senior. 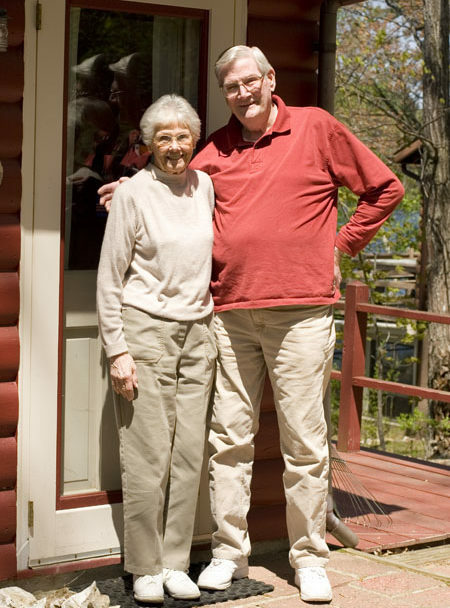 He told them that he had a road down to the lake and that he rented cabins. It nearly drove them crazy because they could see the lake on the map and couldn’t figure out how to get to it. There were no signs that indicated a lake was there. We were Ford people; we had a used 1953 Plymouth. What were your first impressions of the lake? Our first impressions were that the lake was very empty and very dark. We came up with another couple that first year, 1957. My father took us for a ride in his little 14’ aluminum boat down the shoreline at night. And, the motor fell off! There were no lights or camps anywhere to be seen. My friend was a real city girl and absolutely terrified; I thought the whole thing was very funny. We used to call my father “Jim Bowie” because he was a great one for going off exploring. Did you vacation on the lake before moving here year round? Every year! We vacationed here every summer from when my parents built a camp on this property in 1959 up until we retired here in 1984. We have never lived here year round; we have gone to Florida for three months during the winter since retirement, except for 2005, which was not the year to stay for the winter. How did you use the lake in the early years? My folks had a wooden powerboat with a 40hp motor on it. We also had a rubber kayak, a two-seater. When we were younger we paddled every inch of the lake in that thing. You could go everywhere in that because you didn’t have to worry about hitting bottom. Then we bought a canoe and covered every inch of the lake in that. We made great use of the lake. Most people had a boat back then. The boats weren’t as large as they are now but, they were big enough to water ski. Jimmy Cahill and another fellow who had an inboard motor used to race. Back then you could race on the lake and there was no chance that you’d run into somebody else. There was a lot of water skiing on the lake; it was a big activity for people here. It was quiet then, before the State Park nobody knew this lake was here. And, we used to swim a lot. Back then we had a beach. Where we have a wall now there was a sandy beach. The water level was much lower before the State Park. When they opened the Park, they raised the water level and a lot of people lost their beaches. It probably came up about four feet or so. There used to be nice cranberry bogs back behind Big Island. My father would go back there and collect cranberries and we would have them on Thanksgiving. He would run into wild turkeys back there as well. Most of the camps here had lake water as access water, very few had a well. So, you had to get drinking water somewhere else. There was a spring on Rte. 156, or Nottingham Road as people called it, where my parents and others would go to fill up bottles for drinking water. When the State Park went in, they put in a well and people would go over there to get drinking water. There was a place we called “otter run” on the shoreline of Big Island before you get to the twin islands. When it was wet they would climb the hill and slide down. There was a pair of otters that did that. We would canoe over to watch them. We also saw the beavers a lot as you turned the corner into Fundy. For a number of years there weren’t any loons on the lake or at least you didn’t see or hear them. Then they came back in the 1980’s. One fall we saw a moose swimming down the lake. Last year Al saw a bear crossing Shore Drive, I think it was a momma bear but I didn’t see the cubs. We used to see a lot of really big snapping turtles. They used to walk up to the road, dig a hole, and lay their eggs. There have always been cormorants on the lake as well. There was quite a bit of hunting back then. People would boat over to Big Island to hunt. When you heard gunshots over there, you knew hunting season had started. People used to put duck decoys around the little island by the bridge. Actually, they still do that. How developed was you neighborhood when you first owned property here? There were quite a few camps on the lake back then, Hatetoquitit and Kolitaday were here, and a bunch of camps in White’s Grove. There were at least three camps on Big Island that were on a 99-year lease from the State. They could only get in by boat. When they decided to put the State Park in, those camps were torn down. There was a man with a seaplane that had a camp on little island just on the left as you enter the North part of the lake. He used to park his plane in the little channel behind the island. You can still see a part of the foundation on the island. They could get to their camps in the wintertime over the ice but there weren’t any roads. Back then people could afford to have two houses, your permanent home where you worked and a summer camp. There weren’t any camps down past the two little islands heading towards Fundy as there are now. When you bought your property was there a house or a camp on the lot? My parents bought the lot and built a camp here; there was nothing here. Most of the houses on our road weren’t here yet. Archie Fernald built our camp. My father worked for Western Electric in North Andover, MA. He had two friends that worked there at the same time. They came up to see the property my father was buying and decided to buy the lots on either side of him. And, they built their camps at the same time. When did you start living here year round? Like I said, we moved here year round when I retired in 1984. How many people owned your property before you? 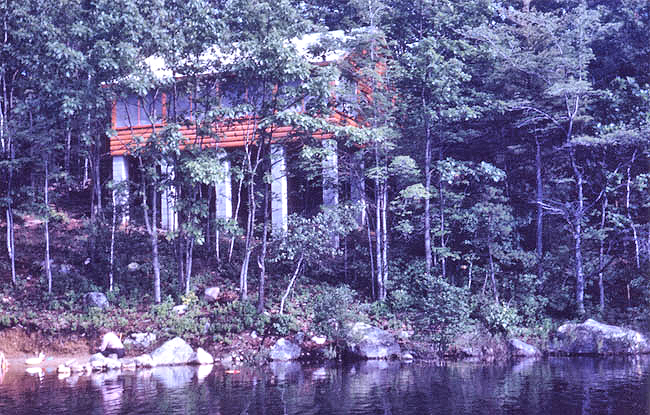 The Cahills owned the property. There was probably somebody before them but nothing had been developed yet. Did you have a connection to the previous owner(s)? What improvements have you made to the house/camp/property over the years? What a big list! We turned my parents’ camp into a year round home. We changed the windows, put in a well, added the decks and remodeled without changing the size of the original camp. We finished the big empty room under the camp. There was no way to get from downstairs to upstairs without going outside and walking around the camp. One of the first things we did was install our spiral staircase and finish the downstairs into living space and put in propane heat. Our original roof was white shingles. We once hiked up to the top of the fire tower and were surprised that we could see our house clearly because of that roof. What kind of plants have been the most successful in your garden? Hostas. They require no improved soil, no care and they come up every year. You can divide them over and over again every year to have more. Any type of lily will do the same thing. We have tried lots and lots of other plants and flowers but they failed. That’s primarily because I didn’t want to change out the soil. Sedum grows well. There is so much shade not everything will grow. How many generations of your family have lived or visited here? Five generations have either lived or come to visit us here. Some summers it was like we were running a hotel; we had people leaving in the morning and new guests arriving in the afternoon! Now many of our friends are too old to make the drive out here. Our kids live in New Jersey and their life is so busy they don’t find a lot of time to get all of the way up here. But, for many years this was a very busy place. Have you had many friends on the lake? My parents had many friends come visit them up here. In fact, many families on this road first came up here to visit my parents. The Gliddens, Harts, Rudowskis, and Hagermans all had come up here first as guests and then bought property. Because we lived in New Jersey, most of our friends were from there. It was too far for them to come to have a summer place. And, since they had a free place to stay any time they wanted, why buy one? Are they still living on the lake? The profile of people on the lake has changed. Most of the people we initially knew were friends of my parents and they either aren’t with us anymore or have moved off of the lake. 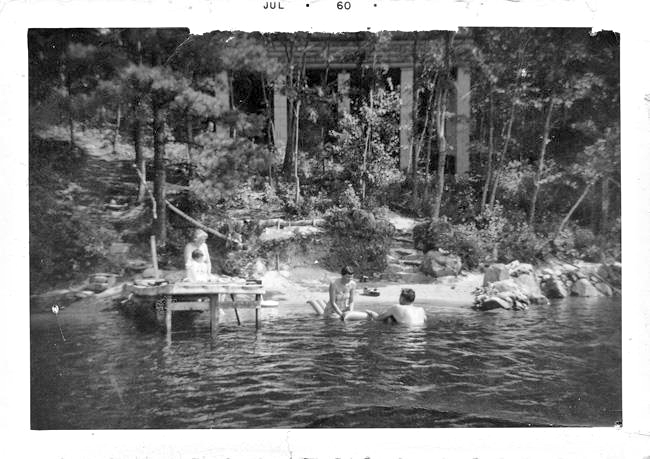 When our generation bought property on the lake it was for summer camps. Now, no one can afford to have two homes. Now people are building year round homes, you don’t see anyone putting up a camp. And, there isn’t any property left to build on, anyway. People are having to buy existing camps and tear them down or rebuild them. The hardest thing about living on the lake as you get older is upkeep of your home. We don’t have family living nearby, and you can’t find a handyman anymore. There used to be people available to do things you needed. Now it’s hard to find anyone to help with things we can’t do on our own. Our lot is very challenging at our age. So, it’s difficult to keep things up ourselves and expensive to have someone else do it. We’ve been lucky in having great neighbors who look out for us. What do you love about Pawtuckaway Lake? Today, not as much we did 10 or 20 years ago. Now there are too many boats, too much activity, and too many people who don’t treat the lake the way it should be treated. It’s a beautiful lake, a lovely lake, and I guess what we really miss is the serenity. We get that in the fall, winter, and spring but summer—forget it, especially July. I think that the boat launches have given access to the lake for too many oversized boats. I don’t think the State controls the number or size of boats that can use the launch. So, it gets too busy on summer weekends, not so much during the week. When you see a double-engine boat that someone could live on sailing by, you know things have gotten out of hand. This lake is mostly no-wake zones. What do you need a 250hp boat for? You are going from one end of the lake to the other in under 30 seconds. What is your favorite wildlife moment? We love the loons. They’ve been a great source of enjoyment for us. Years ago we would take our pontoon boat out and park it to watch the loons. I remember the first pair of loons that raised twins through to maturity, which was a real thrill. The mother would be teaching the babies how to catch fish. I remember these little loons were like corks, bobbing up and down in the water. They tried to dive down but popped right back up. 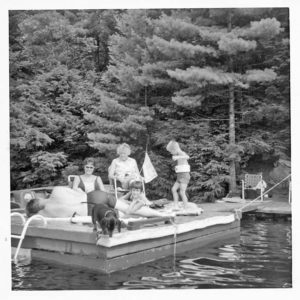 In 1984 we bought our first pontoon boat. Ours was the 8th pontoon boat on the lake and John Decker had the 7th. I know because Joan would go with the Deckers every spring to count them. It had to be the State Park. I remember when they announced the State Park was going in a lot of the old timers were violently opposed to it. They thought it was going to be a horrible thing for the lake but I think it ended up being one of the best things that happened to the lake. It preserved all that land and wildlife. And, it kept the lake from being over populated by housing. But, initially, people weren’t thrilled about it. The other interesting thing was in 1985 when they drained the lake. The dams had to be repaired so they started lowering the lake in early October. It was filled back up in the spring when we came back from Florida. We learned that there is a natural sand bottom to this lake. There is only a crust ¾ to 1 inch deep over the sand. And, there are more rocks under the water than we thought! They blasted a few of the larger rocks in the lake when the water was down; I think they should have removed more of them, especially the rock under the lighted buoy. It was a lot of fun walking all around the lake bottom. You don’t really want to hear crotchety old people complain about the noise and over-population do you? I think it was the Boston Herald that did it. Back 12 years ago or so they ran a story about bass fishing on Pawtuckaway Lake. They had a big map of the lake, where to put your boats in, and all about the fishing. Then all of the sudden we had all these bass tournaments out here that we never had before. We don’t mind little fishing tournaments, but now they have really large ones and the waves just about tear our dock off its hinges. But, it’s still a beautiful lake. It is beautiful Monday through Friday, anyway. Well, you know, when you get older noise bothers you more. It’s really the quantity of people and boats that has changed. What is the biggest challenge facing the community in the coming years? I think there should be a restriction on the size motor that is used on this lake for many reasons, pollution is one and safety is another. On this lake in particular, there isn’t much room to be going that fast. And, there are too many people using the lake to go that fast in such a contained space. We also are very concerned about the spread of weeds and algae. These larger, faster boats are chewing up the bottom in the shallow areas, especially with the boat launch being at the far end of the shallow part of the lake. I think that it is education. How do you enjoy the lake without ruining it? Like any ecology, if it is overused it is going to develop problems. You have to learn to deal with the growth. People can’t afford to just have a good time on the lake without being responsible for what goes on. I don’t think that as a whole people are any different than they used to be, it’s just that there are so many more of them. Every little thing people do that affects the lake is being done by a lot of other people; it all adds up, nothing is insignificant. Is there anything else you would want people to know? Actually, I’d like to know if there is anyone on the lake that remembers Herb Borer’s tamed bass? My father Herb had tame bass that lived underneath the float and came back every year. He spent most of his spare time going out to catch shiners to feed them. People came by all the time asking to see him feed those bass. They would come out from under the float to be hand fed. My kids could go under the float and feed them and even pet them. There was one bass we called “Scarface” he had to be 12 inches long and had a scar on the side of his head. So, you always knew it was him. They were a big attraction.